My kids, I think, are culturally neither here nor there. They are part Pakistani (yes, I know “Pakistani” is technically a nationality and not a race) and part Malay and part a whole bunch of other things *S* … They are aware of their ethnic identity (whatever it is! ), but in shaa Allah define themselves as Muslims first and last. They love learning about Muslims living in other parts of the world and are thrilled whenever we find a book with Muslim characters. 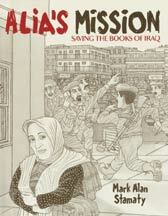 Alia’s Mission: Saving the Books of Iraq by Mark Alan Stamaty Mark Alan Stamaty is a well-known writer and illustrator with long-running comic strips under his belt. This particular book was something new for my daughter who has never read a comic. She found Alia’s Mission a compelling read … and why not, the heroine is passionate about books! Both these stories are about Alia Muhammad Baker, the chief librarian of Basra’s Central Library. There is talk of an impending war in Iraq and Alia is anxious about the fate of her cherished library, which holds, among other gems, a biography of the Prophet that is 700 years old. She approaches the governor for permission to move the books to safety but is denied. Undeterred, Alia loads the books into her car at the end of each day and takes them home. When war is declared, her friend Anis, who owns a restaurant close to the library lends a hand. He rallies his family and hides the books in his establishment. Together, Alia and her comrades manage to save 30,000 books before the library is razed. Rather than rely on graphic descriptions or frightening pictures, Winter uses colour to illustrate the message – deep maroons for war and then blues and pinks to signify hope. Stamaty’s book goes into greater detail and shows how the love for learning and books unified the people – even those who probably didn’t know how to read lent a hand! It also tells of how Alia, who went over and above the call of duty, suffered a stroke due to stress and exhaustion. We enjoyed both these books tremendously – they really struck a chord! 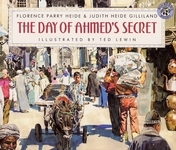 The Day of Ahmed’s Secret by Florence Parry Heide & Judith Heide Gilliland, illustrated by Ted Lewin: I had forgotten to mention this so I’ll do it now. I heard about this book from my friend Suzanne. She teaches English and spoke so passionately about this book that I HAD to go out and get it! Before I talk about this book, I MUST talk about the illustrator, Ted Lewin. I can’t draw or paint for toffee but I have always longed for the ability. Ted Lewin has illustrated several books that Ms M and I enjoy. He has an inimitable style that gives the stories warmth and life. His watercololours are remarkably detailed and in this book, he and the authors expertly capture the sights, smells and sounds of the markets and busy streets of Cairo. I sometimes feel as if I were looking at a photograph! I’ve discovered the secret to his realistic and vibrant pictures – he uses his friends and neighbours and their kids as subjects and directs them to ‘act’ out the story while he photographs them in the studio! You can read about it here. The Day of Ahmed’s Secret is about Ahmed who rides through the streets of Cairo to deliver cylinders of butane gas (it is for cooking) to his father’s customers. He has a secret to tell his family, but it must keep till the evening. Ahmed seems rather young for such hard work but he does it patiently and quite obviously, out of a sense of love and duty for his family. We sense how mature he is in his quiet introspective nature and in how he understands why he has to grow up quickly to help ease his father’s burden. As Ahmed weaves in and out of the city, we meet various characters – the food vendor who always has a word for him, the rose water man, the customers and all the folks who make up the hustle and bustle of Cairo that he is a part of. He reflects on how old the city is and talks of the desert in almost sentimental terms. Through it all, we are constantly reminded of the secret he is carrying. When he finally returns to the warmth and comfort of home, he finally divulges his surprise. Young Ahmed proudly reveals that he can write his name. We see a copy of his Arabic script and the beaming faces of his family. Ahmed may be older than most children who already know how to read and write, but it is no less an accomplishment. I felt like thumping his back when I read this book! 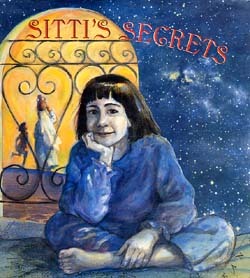 Sitti’s Secrets by Naomi Shihab Nye, illustrated by Nancy Carpenter: Mona lives in the US and her Sitti (grandmother), in a small Palestinian village. Distance at first separated them and then language but both these barriers were overcome when Mona visited. She misses her grandmother and begins to remember that beautiful time when they were together. At first, they communicated through Mona’s father who translated for them and was like their “telephone”. Slowly, however, they made up their own language and let the love bind them ever closer. She reminisces about the house, the countryside, Sitt’s tea and lemon tree and the age-old customs of the Palestinian villagers. Most of all, she remembers the close bond she forged with Sitti – one particular incident that stands out is when she brushed Sitti’s hair. Mona recalls how difficult it was to leave – even her father kept going outside to hide his tears. Mona keeps the connection alive with her grandmother by thinking of how they and indeed, all of mankind, are bound to each other as part of a beautiful universe. I love this book – it is simply told but so wonderfully lyrical and emotive. The illustrations, with all their subtle touches capture the colours of the desert (I love the picture of Sitti’s lemon tree) and the love between Mona and her grandmother. One Green Apple by Eve Bunting, illustrated by Ted Lewin: We have our pet authors and Eve Bunting is one of them. We enjoyed The Memory String, Gleam & Glow, Pop’s Bridge and Whales Passing. One Green Apple is about Farah, a Muslim girl who is new to America. Her headscarf and inability to speak English set her apart from her classmates, some of whom are friendly and some of whom have mentioned her home country in less than friendly terms. Her father has told her, “Our home country and our new one have had difficulties.” We are not told where Farah is from but I suspect it must be Pakistan or Afghanistan from the word “dupatta” that the author uses for the shawl she wears. On this day, Farah and her classmates are visiting a farm. She enjoys the sights and smells but is very anxious and feels “tight inside”. When she goes to pick an apple, she chooses a small green one that fits right in her hand. Farah likes it even though the others choose the sweet, red ones because it is different like her. The barriers begin to break, tentatively, but surely. At first, a friendly girl Anna reaches out and then she joins in making apple cider by helping to operate the press. On the way back, she enjoys a lighthearted moment with her new friends. She finally has the courage to say her first “outside (her)self” word – “App-ell” and her friends applaud her. I love the illustrations – Ted Lewin’s winning work! They are bright, sunny and so full of hope! It was nice to also see Farah’s isolation and shyness fall away into a confident, triumphant smile. The Roses in My Carpets by Rukhsana Khan, illustrated by Ronald Himler: This book made me choke up. A young Afghani’s recurring nightmare pulls us into this story – “It’s always the same. The jets scream overhead.” He dreams of running to escape the bombs together with his mother and sister, Maha. In his dreams, they weigh him down and always, he wakes up to his bare home in a refugee camp. In quiet and almost grim tones, he tells us about his days. He lives with his mother and sister and they manage to eke out a living with the help of a sponsor. He prays and goes to school, but his most cherished activity is when he learns how to weave carpets. It is his lifeline – he hopes this skill will help provide for his family. It also allows him to visualise and carve out his dreams – a world of hope and beauty. The nameless protagonist uses red threads to honour the martyrs, blue for the sky, free of bombing jets, black for the night that hides them from the enemy and white for the shroud of his father. He uses no browns for he longs to escape the dirty brown huts of the camp. Maha is hit by a truck one day. When he rushes to the hospital, he sees his mother, face contorted in pain. All at once, the fear of losing yet another family member hits them. However, the boy consoles his mother and tells her to go home and pray for Maha. He realises then how he is as tall as his mother and truly the man of the family. The doctor later gives him the good news that Maha will recover. He returns home to his mother and they share a quiet dinner without Maha. It is obvious they miss her sorely – he would often share his bread with her and this time, they tear the bread into three pieces out of habit. The story ends on a hopeful note – that night, he dreams again but this time, his mother and Maha do not hold him down. They find a space where the bombs do not touch them, where the earth is strewn with red roses and where the sky is blue and free from the menacing jets. wa `alaykum as salaam wa rahmatullaahi wa barakaatuh everyone! Suzanne: !!! You’ve got mail… are you guys still meeting up regularly? I ran into Nazlin the other day – oh the nostalgia!